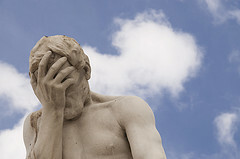 The National Republican Senate Committee (NRSC) and Terri Lynn Land are so eager to continue to beat the anti-Affordable Care Act drum that they appear to have lost all ability to distinguish between it and any other discussion about health care. This was made comically clear over the past two days following an appearance by U.S. Department of Health and Human Services Secretary Kathleen Sebelius in Detroit yesterday. 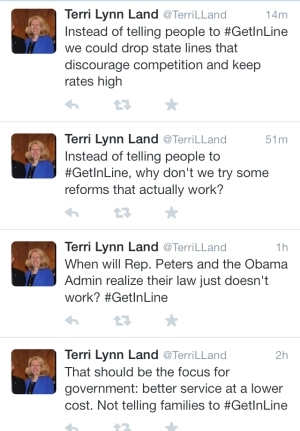 It’s a hilarious example of Obamacare Derangement Syndrome. Sebelius appeared with Detroit Mayor Duggan to discuss getting more people enrolled under the Affordable Care Act. At one point, she was asked by a reporter about people trying to sign up for Medicaid under the new expanded Medicaid rules. Because Michigan Republicans passed Medicaid expansion at the 11th hour and didn’t bother to give it “immediate effect”, working poor Michiganders who qualify for it now have to wait until April before they can receive coverage. I encourage people to go ahead and sign up. Benefits for newly-eligible Medicaid beneficiaries will not start, as you said, until April 1st given the way the legislature passed the law… But, there’s nothing people can do except kind of get in line. For years Gary Peters has joined President Obama and many in his Administration in making misleading claims about ObamaCare. Will Peters remain silent now that the Administration has heartlessly told families and individuals who face losing their current coverage or have been hit with skyrocketing costs to, “get in line”? 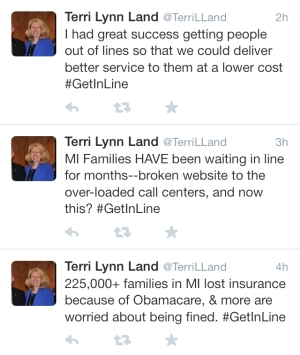 Michigan Senate candidate Terri Lynn Land took to Twitter to give a voice to some of the 225,000 Michiganders told to “get in line” by the Administration. 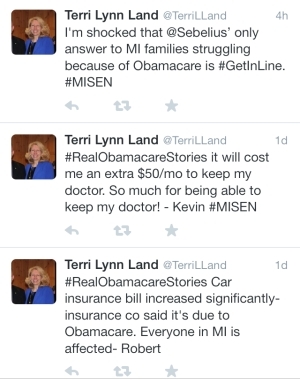 Terri Lynn Land wants to represent the state of Michigan in the United States Senate but she is clearly so unhinged by her raging case of Obamacare Derangement Syndrome that she’s lost the ability to comprehend what’s being said about healthcare any longer. It’s gotten so bad she’s now attacking her own Republican colleagues and appears to be completely unaware that she’s doing it. In other words, she’s not worthy of even RUNNING for the U.S. Senate much less being a member of it. With this sort of inadvertent inter-Party warfare going on, it’s little wonder Land has yet to secure the endorsement of the Michigan Republican Party or any major Republicans. The only thing she appears to have going for her is a huge personal bank account and the support of the Koch brothers front group, Americans for Prosperity. Fortunately for us, Michiganders are just not that stupid.